However with direct investments in oil and gas, there is the possibility of the loss of a portion, or all, of the investment principal if the well or wells are unsuccessful. Furthermore certain direct investments are relatively illiquid and very difficult to sell to others. Certain direct investments in oil and gas provide a monthly payment for the oil and natural gas sold during the month. Some refer to this as 'mail box' money because it comes in with no effort on the part of the investor. In addition, oil and gas wells may provide significantly higher returns during the first few months of production. As a result, the payback of oil and gas investments may be as little as 2-4 years, depending on the particular investment and oil and gas prices. The US's dependency on foreign oil is a key topic, particularly with the developments in the Middle East. To encourage the development of U.S. reserves, direct investments in oil and gas have tax advantages not available to other investment classes. Investments in oil and gas are less dependent on the economy or interest rates compared to traditional investments like stocks and bonds. As a result, these investments may provide a hedge against a downturn in the economy, particularly if the downturn is the result of a shortage of oil and gas. However making direct investments into oil and gas does have a learning curve. Among other things, it takes understanding of the various types of investments possible and the various risks involved as well as how to manage these risks to the extent possible. Not all investments in oil and gas are the same. For many, they think of investing in oil and gas as 'wildcatting' - which is going out into an unproven area in the hope of being the first to strike oil. However there are investments into 'proven fields' where it is generally known that oil and gas exists. Further there are production deals where investors are buying one or more wells which have already been drilled and are producing oil and/or natural gas. So the risks involved can vary widely as well as the returns. Investing in oil and gas also involves taking a disciplined approach similar to the approach taken by oil companies. Only qualified investors are allowed to make direct investments in oil and gas. Under US law, the ownership of land includes 'surface rights' and 'mineral rights' for any minerals which may be below ground. Mineral rights may be severed from the surface rights. As a result, the owner of a piece of land might have the surface rights but not own the right to the minerals below ground (minerals ownership). The owner of the mineral rights has the right to explore for, and to produce (remove) oil and/or gas, or other minerals from their property even thought they don't own the surface rights. They also have the right to access the surface of the land in order to explore and produce the minerals. Once an area has been selected, the right to drill must be secured by the producer. The right to drill usually involves leasing the mineral rights of the desired property. A lease agreement creates two specific interests: a 'royalty interest' and a 'working interest'. The 'royalty interest' is the right to receive a certain portion of the proceeds without sharing in the costs incurred in producing oil, such as drilling, completion, operating or production costs. The royalty interest is the interest of the mineral rights owner. The costs incurred in producing oil and gas, are borne by the holder of the lease which is referred to as the 'working interest'. After the leases are secured, then drilling can begin. One of the most common methods of drilling is the rotary method. With rotary drilling, a hole is drilled by the continuous turning of a drill bit. The most common bit looks like a cluster of gears. The bit, which is hollow, is attached to the drill stem. The drill stem is hollow pipe which is lowered down the well by adding lengths of pipe. The drilling fluid is called 'mud'. Mud is circulated down the center of the pipe, through the bit and goes back up towards the surface. The mud removes cuttings from the hole, lubricates and cools the bit and prevents a blow out if a high pressure area is punctured. After or during drilling, the well can be evaluated to determine if oil and gas is present using one of the following techniques (1) well logging, (2) examining the cuttings, or (3) coring. - A common technique is well logging. Using this approach, a device is run down the hole which is able to measure the formations that they pass. This creates a record of the formation similar to an electrocardiogram or EKG in the medical industry, which can be examined by a geologist to determine the presence of oil and/or gas. - Another technique is to examine the cuttings which flow back up the well pipe using a variety of devices. - Coring entails obtaining core samples from the well and examining the presence of oil and gas. After carefully examining all the data, the producer makes a decision to complete the well or abandon the well. If the operator decides to proceed, he will set casing. A string of casing is run down the well beyond the pay zone towards the bottom of the well. At this point the pay zone is sealed off - but only temporarily. After the casing string is run, the casing is cemented into place. Since the pay zone is sealed off by the production string and cement, perforations must be made in order for oil or gas to flow into the wellbore. This is accomplished by a perforating gun which is lowered down the well to the zone of interest. The gun is detonated from the surface which shoots a few dozen holes that penetrate the casing and the surrounding cement. When the oil and gas is contained in sandstone and shale, a process called fracturing may be used to increase permeability of the formation. To fracture a formation, a specially blended fluid is run down the well and into the formation under great pressure. Pumping continues until the formation literally cracks open. Meanwhile sand or other small beads ("proppant") are mixed into the fracturing fluid. The proppants enter the fractures in the formation, and, when pumping is stopped and the pressure drops, the proppants remain in the fractures. The proppants hold the fractures open. Getting natural gas from a well can be a fairly straightforward operation - just like letting air out of a balloon. Gas which is compressed in the formation expands as it flows to the surface. Getting oil from a well is usually more involved as oil is heavier than gas. Greater pressure is usually needed to force the oil to the surface using a variety of techniques or it can be lifted to the surface, using the same principles as old fashioned water wells. 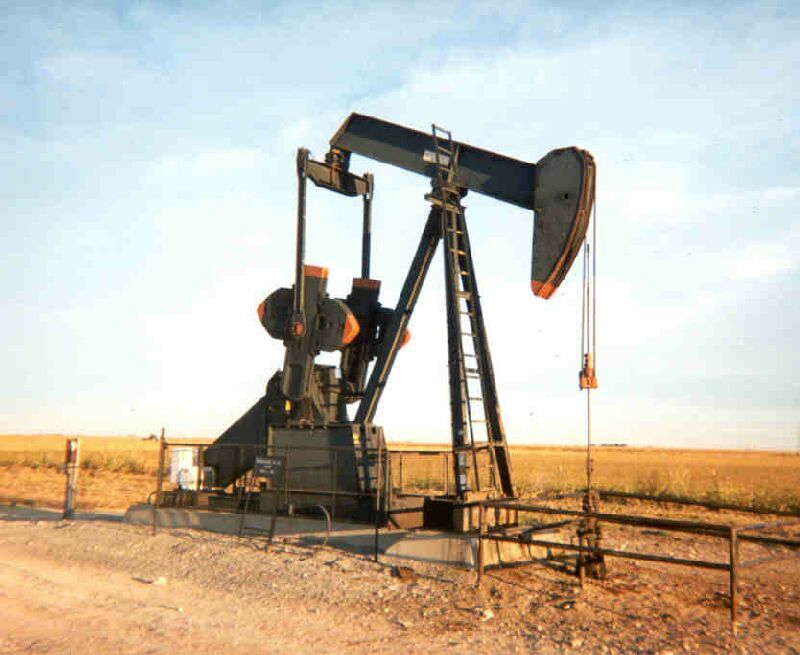 The equipment at the surface which is lifting the oil from the well is called a 'pump jack'. Pump jacks are what most people think of as an oil well. Oil is usually accompanied by water which is separated at the surface. The oil is pumped into collection tanks where it is picked up periodically and then sold in the market. Natural gas requires a pipeline to be run from the well into larger pipelines for the area. As a result, the transportation costs for natural gas are typically higher than oil. Payments for oil and gas are usually made 30 days following the month of collection. Before a well is drilled, the producer will prepare a budget for the cost of putting the well into production. This is called an Authorization for Expenditure or AFE. From the AFE, an investor can determine beforehand what the producer believes the total of the well will be. The AFE will include a detail listing of costs which can be used to determine the Intangible Drilling Costs and Tangible Drilling Costs. The Intangible Drilling Costs can range from 50 - 75% of the total cost of the well. Buying Production: Buying production often means buying working interests in wells which have already been successfully drilled. The investor is not taking any of the drilling risks, but has the benefits of the stream of income related to the oil and gas well. Working Interest: Working Interest in an oil and gas well is an ownership interest in the operations of the well. There are significant tax benefits related to investing in Working Interest which are not available to other investment classes. Furthermore the payback may be between 2 to 4 years. Royalty Interest: Royalties consist of income received by those who own the mineral rights where an oil or gas well has been drilled. Unlike other countries, in the USA mineral rights are privately held and individuals or groups enjoy the benefits of ownership. The royalty income comes "off the top" of the gross revenue generated from one or more wells. Unlike Working Interest Owners, mineral right owners assume no liability of any kind related to the leases or wells. However mineral right owners are not eligible for any of the tax benefits enjoyed by Working Interest Owners. Mineral Rights: Mineral rights in and of themselves can be of value regardless if wells have been drilled on the land. Non producing mineral rights can appreciate significantly as operators move into the area and the prospects of obtaining royalty income for the mineral rights improve. Further royalty income can increase as operators drill more wells on a given piece of land. Leases: Leases provide the owner the right to drill wells on particular pieces of land (of course they will have to pay the mineral owners a royalty for any oil and gas obtained). Leases will generally stipulate that a certain number of wells be drilled during a given period, as mineral rights have a vested interest in seeing that their mineral rights are extracted due to the potential for royalties. Leases can also appreciate significantly as operators move into a particular area and drill successful wells. As leases have a defined term, investment in leases can be very risky as the lease may expire without any wells being drilled on the property. However the returns can be very high. The existence of this website should not be construed in any direct or indirect manner as a solicitation for securities. We cannot guarantee the completeness, timeliness or accuracy of the information contained in this web site. Nothing in this web site contains investment advice. Any decisions based upon the information contained in this web site are the sole responsibility of the user. This site is for informational purposes only and is to be used only as a starting point for potential oil and gas investment considerations. Consult with a tax advisor and legal counsel before you make any investment decisions regarding investments in oil and gas, 1031 exchanges, changes to your 401(k) or investments using your 401(k). In making an investment decision, investors must rely on their own examination of a partnership; which include the merits and risks involved, including the management, and any partnership agreements, or other written materials used to represent the investment for consideration of oil and gas direct investments. Oil and gas investments are subject to significant risk and are not suitable for all investors. Investments are generally subject to significant fees and expenses. An investment could result in partial or complete loss of the principal investment. Oil&Gas investments are speculative in nature, and are investments involving a high degree of risk. Persons considering these investments must be accredited, sophisticated, and qualified to make them. Fox Oil & Gas examines many opportunities to acquire producing properties. After targeting a property, we research the well and production history, examine the engineering, and finally, we enter into negotiations with the property owner. There is always risk involved when drilling a well; that's why Fox employs competent drilling crews, engineers and geologists to ensure that the drilling operations run smoothly. We will only drill when our geologists and petroleum engineers have thoroughly examined the geology and are confident that we will be able to increase production by drilling an offset well. We offer working interest positions into new oil and gas well drilling ventures to qualified participants with full tax benefits. Fox Oil & Gas is the managing partner over the entire process from beginning to end. Interested in Oil and Gas Investments? § Provide info to participants (daily drilling reports, permits, maps and related geology, production, revenue, expense statements, survey plats, well tests). If you would like more info, please send an email to foxoildrilling@gmail.com and let us know. As many people are aware, the oil and gas business can be a risky one, but there are ways to lower the risks involved. We believe that investing in currently producing oil and gas wells or drilling offset wells has a much lower degree of risk than rolling the dice and betting on a wildcat well. When Fox Oil & Gas (an oil and gas operator) drills a well, it attempts to minimize drilling risk by drilling a well that offsets existing production. Fox Oil typically drills in proven fields, next to currently producing wells. Currently there are several different drilling programs in the development phase, all are exploring for crude oil and natural gas. If you are interested in our current or future activities, please send an email to foxoildrilling@gmail.com and let us know. The United States is the world's largest consumer of oil, and currently imports almost 60% of its oil from foreign countries. Most of these imports come from OPEC countries, six of which are in the volatile Middle East. According to Energy Secretary Spencer Abraham, the energy sector in this country is strained to capacity and is facing its most serious shortages since the Arab oil embargoes and gasoline lines of the 1970's. As the world's largest economy, the United States is naturally the biggest consumer of oil. For forty years our energy demand has grown at a sustained rate of 2 percent annually to a current estimated usage of 18 billion barrels of oil per day. According to the U.S. Department of Energy, our energy demand will be 30 percent higher by 2020. Our dangerous reliance on foreign oil can be diminished by increasing our domestic production as much as possible. Oil is one of the most important natural resources known to mankind. For most societies in the world, oil is the principal natural resource that fuels their economies. Then why, in this great age of communication and technology, do we need to be concerned about a natural resource like oil? Simple. Nearly 98% of everything you have or do is in some way related to crude oil. Heat for your home, gas for your car, 2 liter plastic bottles for pop, and petroleum jelly are just a few examples of products created from crude oil. The United States has the greatest standard of living in the world, as well as the largest economy. Why? Because we have always tried to maintain control over the supply, as well as price, of oil. Over the last 10 years, the U.S. economy has undergone the largest economic expansion in history and cheap oil has fueled this unprecedented growth. Unlike the 1970s, when the U.S. was held at bay by OPEC withholding oil production for political reasons, the growth of the oil industry during the 1990s, and beyond, will be more likely be determined by the laws of supply and demand. As any astute investor knows, it is extremely difficult during these times to find financial opportunities which provide both security and a solid return on your hard-earned money. Conventional investments in CD's, savings accounts, money markets, mutual funds, stocks and bonds, etc. are currently bringing very unsatisfactory returns and, according to the Wall Street Journal and other well-known financial publications, prospects for performance improvements in the near future are not good. With even the best performers projected to provide an annual return of 8 percent or less, the average investor will realize much smaller returns than this. One key to better returns is to diversify your portfolio to take advantage of opportunities which have excellent risk-to-reward ratios while still maintaining your personal and/or family financial foundation. One should not be satisfied with the meager returns of CD's, passbook savings or money market accounts, and with the thousands of mutual funds available, it takes a financial genius to pick the right fund in the right sector. Prudent investment in sound, well researched oil and gas drilling programs, though still considered high risk, may offer a significant monthly cash flow from the sale of production from oil and gas wells, and very significant tax advantages as well. Each investor is treated as a business partner for tax purposes, generating substantial tax benefits which flow directly to individual investors. Investors may receive tax deductions totaling approximately 75 to 85 percent of capital contributions in the first year, with the remaining balance written off during subsequent years. For most investors, percentage depletion and depreciation of tangible equipment costs are available to shelter ordinary income at rates of up to 50 percent of cash distributions in the first seven years and 30 percent thereafter. The drilling program also shelters passive income. In other words, tax deductions obtained from intangible drilling and development costs (as well as depreciation of tangible costs) may be used to offset the investor's taxable income from other sources. Also, a portion of the investor's taxable income generated by the drilling program may be reduced by deductions from depreciations and percentage depletion allowances. THERE ARE SIGNIFICANT RISKS ASSOCIATED WITH INVESTING IN OIL AND GAS VENTURES. THE ABOVE INFORMATION IS FOR GENERAL PURPOSES ONLY AND IS NOT A SOLICITATION TO BUY OR AN OFFER TO SELL ANY SECURITIES. ANY SUCH SOLICITATION OR OFFER WILL ONLY BE MADE THROUGH A PRIVATE PLACEMENT MEMORANDUM ACCOMPLISHED IN ACCORDANCE WITH SEC REGULATION D, RULE 506. IN ADDITION, THE AFOREMENTIONED GENERAL INFORMATION IS NOT INTENTED TO BE INDIVIDUAL TAX ADVICE. CONSULT YOUR PERSONAL TAX ADVISOR CONCERNING THE CURRENT TAX LAWS AND THEIR APPLICABILITY AND EFFECT ON YOUR PERSONAL TAX SITUATION. Interested in Prospective Drilling Operations? In our search for oil and gas, Fox Oil utilizes the most proven geological tools available such as advanced 3D and 2D seismic, subsurface geology using isopach and structure mapping, and advanced well control. We do business with highly qualified and experienced industry professionals. Fox Oil is an exploration and production company and is the managing partner for all of our oil and gas drilling programs. In addition, Fox Oil is constantly reworking existing wells and looking for opportunities for the drilling of new wells that meet our high standards. For 2013 Fox Oil currently has several different drilling programs in the development phase, all are exploring for crude oil and natural gas, drilling wells that range in depths from 5,000' down to 10,000'. Information pertaining to our most current drilling ventures cannot be found on this website. If you are interested in our current or future activities, please send an email to foxoildrilling@gmail.com and let us know. We offer working interest positions into new oil and gas well drilling ventures to qualified participants with full tax benefits. Fox Oil is the managing partner over the entire process from beginning to end, utilizing subsurface geology, well control, and 2D or 3D Seismic technology, our geologists identify a prospective area or anomaly, we acquire the mineral leases over the prospect, obtain funding, operate and drill the well, complete the well, and we handle the day to day operations and sell the gas and oil. We send out revenue checks monthly and handle all the tax preparation pertaining to the ventures and provide that info to participants along with daily drilling reports, permits, maps and related geology, production, revenue, expense statements, survey plats, well test reports, etc., relating to the well. If you would like more information, please send us an email at foxoildrilling@gmail.com. THERE ARE SIGNIFICANT RISKS ASSOCIATED WITH INVESTING IN OIL AND GAS VENTURES. THIS IS NOT A SOLICITATION TO BUY OR AN OFFER TO SELL ANY SECURITIES. ANY SUCH SOLICITATION OR OFFER WILL ONLY BE MADE THROUGH A PRIVATE PLACEMENT MEMORANDUM ACCOMPLISHED IN ACCORDANCE WITH SEC REGULATION D, RULE 506. Current Drilling Operations Please Note: Information found on this page and throughout this web site is only concerning ventures that were fully funded months ago, closed out, and are currently involved in the drilling or completion process, or in production. Nowhere on this site will you find information about current or future ventures. This website is for information purposes only and any information contained herein is not intended to be any form of solicitation. For 2013 Fox Oil currently has several different drilling programs in the development phase, all are exploring for oil and natural gas, drilling wells that range in depths from 5,000' down to 10,000'. If you are interested in our current or future activities, please let us know. We offer working interest positions in new oil and gas well drilling ventures to qualified participants with full tax benefits. Fox Oil is the managing partner over the entire process from beginning to end, utilizing subsurface geology, well control, or 3D Seismic technology, our geologists identify a prospective area or anomaly, we acquire the mineral leases over the prospect, obtain funding, operate and drill the well, complete the well, and handle the day to day operations and sell the gas and oil. We send out revenue checks monthly and handle all the tax preparation pertaining to the ventures and provide that info to participants along with daily drilling reports, permits, maps and related geology, production, revenue, expense statements, survey plats, well test reports, etc., relating to the well. If you would like more information, you can email us at foxoildrilling@gmail.com. What are the benefits of Horizontal Oil Drilling? Horizontal wells generally increase productivity to at least 2-3 times that of vertical wells. For wells which would have otherwise been considered marginal or uneconomic, horizontal drilling often enables successful reservoir development. The oil or natural gas in some types of reservoirs can be most thoroughly recovered by horizontal drilling. How does Horizontal Drilling work? 1. A small diameter “pilot hole” is drilled using a steerable bit. A bit is a cutting devise that cuts rocks and makes the hole during drilling. A steerable bit is one that can be oriented in various directions, both up and down and in any compass direction. 2. The bit and driller communicate using computers that can send and interpret vibrations sent through mud in the hole. Mud, used to lubricate and cool the bit during drilling, transfers vibrational signals much like copper wires transfer electronic signals in your personal computer. 3. Mud vibrations sent from the surface tell a computer at the bit where it should point for drilling. The drill bit sends precise information on its depth, location and alignment back to the driller. In this way the operator can steer the bit and create a hole around sensitive features and environments without disturbing the surface. 4. When the drill emerges at the other side of the pilot hole, it is replaced at the end of the drill string with a “reamer” that bores out a hole large enough to accommodate the pipeline. The drill string is pulled back through the pilot hole and the reamer widens the hole as it moves along. 5. The drill string makes a third pass through the hole, this time pulling the pre-welded and tested pipe into place behind it. Why should I invest in oil today? As oil and gas supplies are declining, the global demand is on the rise. Over the last five years, the world burned 30 billion barrels of oil each year, however it only discovered 3 billion barrels of new oil each year. Oil is used to manufacture virtually everything we use on a daily basis, from clothing and pharmaceuticals to detergents and insulation. The facts are there are thousands and thousands of petroleum-based products that we rely on everyday. This translates into opportunity for smart investors. Crude oil and natural gas are finite resources and we are currently using more oil worldwide than we are producing. Economics 101 tells us that when a commodity supply decreases and demand on that same commodity increases it can mean only one thing – Higher prices! Now you can take advantage of the higher prices to come with a direct investment in oil & gas. In fact, with the instability associated with many oil producing countries, many experts believe that oil prices could get as high as $200 to $300 a barrel soon. What are the potential returns from oil and gas? Each project has an individual risk/reward profile. Although developmental projects can provide steady production and cash flow, they rarely generate the kinds of returns available in successful exploratory wells. Recently the definition of exploratory well has changed with the major advances in technology and drilling techniques. When evaluating a prospect, it is important to first decide what degree of risk you are comfortable with. However, if you think participation in an oil or gas venture might be for you, evaluate each prospect on a cash-on-cash basis before considering the tax benefits. There are significant and long-term tax benefits associated with oil & gas investments that no other investment can give today. An investor will be able to deduct from his/her ordinary income, passive and portfolio income, capital gains, and sales activity, etc. Actually, in about 3.5 years after making the investment, you will be able to write the entire investment off! You cannot do this in stocks, or even in real estate, which uses long term, straight-line depreciation. In the first year alone, you can write-off approximately 80% of the investment you make in oil & gas. So, instead of paying the IRS, you are able to put money into another investment that can make you more money. Once you send it to the IRS, you don’t see it again. Please note the following information is for informative purposes only. Please consult your tax advisor for personal financial impact/results. Natural gas and oil development from domestic reserves helps to make our country more energy self-sufficient by reducing our dependence on foreign imports. Therefore, Congress provided tax incentives to stimulate domestic natural gas and oil production financed by private sources. These tax benefits enhance the economics of natural gas and oil projects. An owner of a working interest in oil or gas property is permitted to deduct otherwise allowable losses attributable to the working interest against other income without limitation under the passive loss rule. [The Tax Reform Act of 1986 introduced into the Tax Code the concepts of “Passive” income and “Active” income, which prohibits the offsetting of losses from Passive activities against income from Active businesses. The new Tax Code specifically states that a Working Interest in an oil and gas well is not a “Passive” activity; therefore, deductions can be offset against income from active stock trades, business income, salaries, etc.] [See Section 469 (c) (3) of the Tax Code]. Dry Hole – all invested dollars may be written off as an ordinary loss against ordinary income in the year incurred. Tangible Costs – Approximately 15 – 25% of the investment constitutes tangible drilling costs (well equipment), which is depreciated over a 7 year period. [See Section 263 of the Tax Code]. Example: A participation of $25,000 could result in approximately $21,250 in tax deductions for IDC even if the well does not start drilling until March 31 of the year following the contribution of capital. The remaining $3,750 of tangible costs may be deducted as depreciation over a seven year period (see tax example below). ABANDONED WELL – A well no longer in use; a dry hole that, in most states, must be properly plugged. ACIDIZING A WELL- A technique for increasing the flow of oil from a well. Hydrochloric acid is pumped into the well under high pressure to reopen and enlarge the pores in the oil-bearing limestone formations. ACID TREATMENT – A refining process in which unfinished petroleum products such as gasoline, kerosene, diesel fuels, and lubricating stocks are treated with sulfuric acid to improve color, odor, and other properties. ACOUSTIC LOG – A generic term for a well log that displays any of several measurements of acoustic waves in rocks exposed in a borehole, e.g., compressional-wave transmit time over an interval (sonic log) or relative amplitude (cement bond log). AMINE – Organic base used in refining operations to absorb acidic gases (H2S, COS, CO2) occurring in process streams. Two common amines are monoethanolamine (MEA) and diethanolamine (DEA). AMINE UNIT – A natural gas treatment unit for removing contaminants (H2S, COS, CO2) by the use of amines. Amine units are often skid-mounted so they can be moved to the site of new gas production. Gas containing H2S and other impurities must be cleaned up before it is acceptable to gas transmission pipelines. APPRAISAL DRILLING – Wells drilled in the vicinity of a discovery or wildcat well in order to evaluate the extent and the importance of the find. AREA OF INTEREST – The area immediately surrounding a successful well in which the investors (in the good well) have an implied right to participate in any future wells drilled by the same operator. ARTIFICIAL LIFT – Pumping an oil well with a rod, tubing, or bottom-hole centrifugal pump may be termed artificially lifting crude oil to the surface or doing so by mechanical means. ASSIGNMENT – In oil and gas usage, assignment is a transfer of a property or an interest in an oil or gas property; most commonly, the transfer of an oil or gas lease. The assignor does the transferring and the assignee receives the interest of property. ASSOCIATED GAS – Gas that occurs with oil, either as free gas or in solution. Gas occurring alone in a reservoir is unassociated gas. ATTIC OIL – An unscientific, but descriptive term for the oil above the borehole in horizontal wells; oil in the top few feet of a productive interval which will gravitate or be pressured into the horizontal drain hole. AUSTRALIAN OFFSET – A humorous reference to a well drilled miles away from proven production. BACK-IN-PROVISION – A term used to describe a provision in a farmout agreement whereby the person granting the farmout (the farmor) has the option to exchange a retained override for a share of the working interest. BASKET PRICE – The blanket or average price of crude oil on the world market. For example, the basket price of $18.00/bbl. could mean average price of average gravity. Lower-gravity crude with high-transit cost would bring less than $18.00, and conversely, higher gravity crude with low sulfur and close to market would be a premium – a basket of crude oils of differing gravities, sulfur content, sweet and sour. BATTERY – Two or more tanks connected together to receive oil production on a lease; tank battery. BEHIND THE PIPE – Refers to oil and gas reservoirs penetrated or passed through by wells, but never tapped or produced. Behind the pipe usually refers to tight formations of low permeability that, although recognized, were passed through because they were uneconomical to produce at the time. Today, however, with the growing scarcity of oil and high prices, many of these passed-through formations are getting a second look by producers. B.H.T. – Bottom-hole temperature. In deep wells, 15,000 feet and deeper, bottom-hole temperatures are above the boiling point of water, ranging up to 400 degrees Fahrenheit. At these depths and temperatures, water-base drilling muds can not be used, only oil-based. BIOGENESIS – Formed by the presence or the actions of living organisms, for example, coral reefs and atolls. Biogenesis is also the theory that all life is derived from previously living organisms. BIT, ROTARY – The tool attached to the lower end of the drillpipe; a heavy steel head equipped with various types of cutting or grinding teeth. Some are fixed; some turn on bearings. A hole in the bottom of the drill permits the flow of drilling mud being pumped down through the drillpipe to wash the cuttings to the surface and also cool and lubricate the bit. BIT, SPUDDING – A bit used to start the borehole; a bit that is some variation of the fishtail or drag bit, one used in soft, unconsolidated, near-surface material. BLINDPOOL – Money put into a drilling fund that is held by the fund managers until likely prospects for drilling are found or come along. The rationale for the blind fund is that with ready money, the fund managers can act quickly when good opportunities for investment arise. Blind fund money usually is kept in an interest-bearing account while waiting for a hot prospect. BLOWING A WELL – Opening a well to let it blow for a short period to free the well tubing or casing of accumulations of water, sand, or other deposits. BLOWOUT – Out-of-control gas and/or oil pressure erupting from a well being drilled; a dangerous, uncontrolled eruption of gas and oil from a well; a wild well. BLOWOUT PREVENTER – A stack or an assembly of heavy-duty valves attached to the top of the casing to control well pressure; a “Christmas tree”. BONUS - Usually, the bonus is the money paid by the lessee for the execution of an oil and gas lease by the landowner. Another form is called an oil or royalty bonus. This may be in the form of an overriding royalty reserved to the landowner in addition to the usual one-eighth royalty. BOREHOLE – The hole in the earth made by the drill; the uncased drill hole from the surface to the bottom of the well. B.P.M. – Barrels per minute. The pumping rate of small rotary pumps. BRIDGE PLUG - An expandable plug used in a well’s casing to isolate producing zones or to plug back to produce from a shallower formation; also to isolate a section of the borehole to be filled with cement when a well is plugged. BUTANE – A hydrocarbon fraction; at ordinary atmospheric conditions, butane is a gas but it is easily liquefied; one of the most useful L.P.-gases; widely used household fuel. BUTANE SPLITTER – A type of fractionator vessel at a gas reformer plant that produces commercial propane as well as normal and isobutanes. Splitters are fired with natural gas to provide heat for the distillation. CARRIED WORKING INTEREST – A fractional interest in an oil and gas property conveyed or assigned to another party by the operator or owner of the working interest. In its simplest form, a carried working interest is exempt from all costs of development and operation of the property. However, the carried interest may specify “to casing point”, “to setting of tanks”, or “through well completion”. If the arrangement specifies through well completion, then the carried interest may assume the equivalent fractional interest of operating costs upon completion of the well. There are many different types of carried interests, the details varying considerably from arrangement to arrangement. One authority has observed, “The numerous forms this interest is given from time to time make it apparent the term ‘carried interest’ does not define any specific form of agreement but serves only as a guide in preparing and interpreting instruments”. CASING POINT – A term that designates a time when a decision must be made whether casing is to be run and set or the well abandoned and plugged. In a joint operating agreement, casing point refers to the time when a well has been drilled to objective depth, tests made, and the operator notifies the drilling parties of his recommendation with respect to setting casing and a production string and completing the well. On a marginal well, the decision to set pipe is often difficult. To case a well often costs as much as the drilling. On a very good well there is no hesitation; the operators are glad to run casing and complete the well. CEMENT, TO – (1) To fix the casing firmly in the hole with cement, which is pumped through the drillpipe to the bottom of the casing and up into the annular space between the casing and the walls of the well bore. After the cement sets (hardens), it is drilled out of the casing. The casing is then perforated to allow oil and gas to enter the well. (2) Sedimentary. Mineral material, usually precipitated chemically, that fills the spaces between individual grains of a consolidated (hard) sedimentary rock; the binding material that holds the grains together. The most common binders are silica, carbonates, and certain iron oxides. Other cements are clay minerals, barite, gypsum, anhydrite, and pyrite. CHRISTMAS TREE – (1) An assembly of valves mounted on the casinghead through which a well is produced. The Christmas tree also contains valves for testing the well and for shutting it in if necessary. (2) A subsea production system similar to a conventional land tree except it is assembled complete for remote installation on the seafloor with or without diver assistance. The marine tree is installed from the drilling platform; it is lowered into position on guide cables anchored to foundation legs implanted in the ocean floor. The tree is then latched mechanically or hydraulically to the casinghead by remote control. COMPLETION – To finish a well so that it is ready to produce oil or gas. After reaching total depth (T.D. ), casing is run and cemented; casing is perforated opposite the producing zone, tubing is run, and control and flow valves are installed at the wellhead. Well completions vary according to the kind of well, depth, and the formation from which the well is to produce. COMPLETION FUNDS – Completion funds are formed to invest in well completions, to finance the completing and equipping of a potentially productive well. After a well is drilled into a productive formation, there remain the costs of setting pipe, (casing the well); perforating, testing, acidizing, or fracturing the formation; and running production tubing and installing pumping equipment, separators, stock tanks, etc. The operator who drills the well may not have the financial resources to complete the well, so he may sell part or all of his interests to a completion fund. Completion funds are not as risky an investment as drilling funds, but are less certain than income funds and royalty funds. CORE SAMPLE – A solid column of rock, usually from 2 – 4 inches in diameter, taken from the bottom of a well bore as a sample of an underground formation. Cores are also taken in geological studies of an area to determine the oil and gas prospects. CRUDE OIL – Oil as it comes from the well; unrefined petroleum. DEPOSIT – An accumulation of oil or gas capable of being produced commercially. DERRICK – A wooden or steel structure built over a wellsite to provide support for drilling equipment and a tall mast for raising and lowering drillpipe and casing; a drilling rig. DEVELOPMENT WELLS – Wells drilled in an area already proved to be productive. DISCOVERY WELL – An exploratory well that encounters a new and previously untapped petroleum deposit; a successful wildcat well. A discovery well may also open a new horizon in an established field. DOWNHOLE – A term to describe tools, equipment, and instruments used in the well bore; also conditions or techniques applying to the well bore. DRILLING PERMIT – In states that regulate well spacing, a drilling permit is the authorization to drill at a specified location; a well permit. DRY GAS - A natural gas from the well free of liquid hydrocarbons; gas that has been treated to remove all liquids; pipeline gas. EFFECTIVE POROSITY – The percent of the total volume of rock that consists of connecting pores or interstices. The part of a rock that is capable of holding a fluid (oil, water, or gas) is the effective porosity. ELECTRIC LOG -An electrical survey made on uncased holes. A special tool is lowered into the hole which ejects an electrical current into the rock and records its resistance to the current. The data from the survey is used by the geologist to determine the nature of the rock and its contents. EXPLORATION – A general term referring to all efforts made in the search for new deposits of oil and gas. FLOWING WELL -A well capable of producing oil or gas by its own energy without the aid of a mechanical pump. Normally a pump is put on the well after the pressure reduction inhibits the rate of production. FRACING – The process of pumping fluids into a productive formation at high rates of injection to hydraulically break the rock. The “fractures” which are created in the rock act as flow channels for the oil and gas to the well. FIELD BUTANES – A raw mix of natural gas liquids; the product of gas processing plants in the field. Raw mix streams are sent to fractionating plants where the various components – butane, propane, hexane, and others – are separated. Some refineries are capable of using field butanes at 10 to 15 percent of charge stock. FIELD POTENTIAL – The producing capacity of a field during a 24-hour period. FLARE - (1) To burn unwanted gas through a pipe or stack (Under conservation laws, the flaring of natural gas is illegal.) (2) The flame from a flare; the pipe or the stack itself. FOSSIL ENERGY – Energy derived from crude oil, natural gas, or coal. GAS CAP – The portion of an oil-producing reservoir occupied by free gas; in a free state above an oil zone. GAS WELL – A well that produces natural gas which is not associated with crude oil. GEOLOGY – The science of the history of the Earth and its life as recorded in rocks. HYDROCARBONS – Organic chemical compounds of hydrogen and carbon atoms. There are a vast number of these compounds, and they form the basis of all petroleum products. They may exist as gases, liquids, or solids. An example of each is methane, hexane, and asphalt. IDC – (Intangible Drilling Costs) All cost incurred in drilling a well other than equipment or leasehold. These expenses are 100% tax deductible even if the well is productive. IP – (Initial Production) Production from a well is generally broken down into three categories: a. Flush or Initial b. Settled c. Stripper. It is important to realize that a well cannot maintain the flow rates it made during the first stages of its life. LIGHT ENDS – The more volatile products of petroleum refining, e.g., butane, propane, and gasoline. NON-COMMERCIAL – A well that is not capable of producing enough oil to pay for the drilling. NRI - (Net Revenue Interest) That percent of the production revenue allocated to the working interest after first deducting proceeds allocated to royalty and overriding interest. OFFSET WELL – (1) A well drilled on the next location to the original well. The distance form the first well to the offset well depends upon spacing regulations and whether the original well produces oil or gas. (2) A well drilled on one tract of land to prevent the drainage of oil or gas to an adjoining tract where a well is being drilled or is already producing. OIL BEHIND THE PIPE – Refers to oil and gas sands or formations knowingly passed through, never produced. Such formations usually were of low permeability (tight formations) that, say 20 years ago, were uneconomical to produce when oil was around $5 or less a barrel. Other times formations would be purposely ignored because the operator was going deeper for bigger game, so the less-spectacular, plain-Jane sands were cased off. When the price of crude oil reached $30 per barrel, the bypassed formations looked pretty good and were opened up and produced. OIL-CUT MUD – Drilling mud with which crude oil has been unintentionally mixed. This may occur when drilling into or through an oil-bearing formation whose pressure is sufficient to overcome the pressure or weight of the column of mud in the hole. Oil also may become mixed with the drilling mud when a drillstem test is taken. OIL GRAVITY – The most widely used indicator of a crude oil’s worth to the producer is its API gravity. Normally, the price which a producer receives for his oil depends on its gravity, the less dense oils (higher API gravity) being the most valuable. This price schedule is based on the premise that the lighter oil contains higher percentages of the more valuable products such as gasoline. API Gravity (degrees) = (141.5/sp.gr.) – 131.5. OIL & GAS LEASES – A contract between an oil operator and a landowner which gives the operator the right to drill for oil and gas on his property for a consideration. It is simply a “ticket to hunt”. ON THE PUMP - An expression that means a well is incapable of flowing and that the oil is being pumped to the surface by a “pumping unit”. OPEN HOLE - An uncased well bore; the section of the well bore below the casing; a well in which there is no protective string of pipe. OPEN-HOLE LOGGING – Logging operations in an uncased well bore. The well is logged below the relatively shallow surface pipe. OPERATING EXPENSE – The expenses incurred through the operation of producing properties. ORGANIZATION OF PETROLEUM EXPORTING COUNTRIES (OPEC) – Oil producing and exporting countries in the Middle East, Africa, and South America that have organized for the purpose of negotiating with oil companies on matters of oil production, prices, and future concession rights. OPEC was created in 1960. PACKER – An expanding plug used in a well to seal off certain secti0ons of the tubing or casing when cementing and acidizing or when a production formation is to be isolated. Packers are run on the tubing or the casing and when in position can be expanded mechanically or hydraulically against the pipe wall or the wall of the well bore. PARAFFIN – A white, odorless, tasteless, chemically inert, waxy substance derived from distilling petroleum; a crystalline, flammable substance composed of saturated hydrocarbons. PAYOUT – When the costs of drilling, producing and operating have been recouped from the sale of products on a well. PERFORATING GUN – A special tool used downhole for shooting holes in the well’s casing opposite the producing formation. The gun, a steel tube of various lengths, has steel projectiles placed at intervals over its outer circumference, perpendicular to the gun’s long axis. When lowered into the well’s casing on a wireline opposite the formation to be produced, the gun is fired electrically, shooting numerous holes in the casing that permit the oil or gas to flow into the casing. PERMEABILITY - A measure of the resistance of rock to the movement of fluids. Rocks may have holes or void spaces in them (porosity), but if these holes do not connect, the permeability can be drastically reduced. PINCHOUT – The disappearance or “wedging out” of a porous, permeable formation between two layers of impervious rock. The gradual, vertical “thinning” of a formation, over a horizontal or near-horizontal distance, until it disappears. PIPELINE GAS – Gas under sufficient pressure to enter the high-pressure gas lines of a purchaser; gas sufficiently dry so that liquid hydrocarbons – natural gasoline, butane, and other gas liquids usually present in natural gas – will not condense or drop out in the transmission lines. PLUG – To fill a well’s borehole with cement or other impervious material to prevent the flow of water, gas or oil from one strata to another when a well is abandoned; to screw a metal plug into a pipeline to shut off drainage or to divert the stream of oil to a connecting line to stop the flow of oil or gas. PLUGGING A WELL – To fill up the borehole of an abandoned well with mud and cement to prevent the flow of water or oil from one strata to another or to the surface. In the industry’s early years, wells were often improperly plugged or left open. Modern practice requires that an abandoned well be properly and securely plugged. POROSITY – A measure of the relative volume of void space in rock to the total rock volume. These spaces or pores are where oil and gas accumulate; therefore, a formation containing a high percentage of porosity can contain more hydrocarbons. PROVEN RESERVES - Oil and gas which has not been produced but has been located and is recoverable. PUMP, CASING - A sucker-rod pump designed to pump oil up through the casing instead of the more common method of pumping through tubing. A casing pump is run into the well on the sucker rods; a packer on the top or bottom of the pump barrel provides packoff or seal between the pump and the wall of the casing at any desired depth. Oil is discharged from the pump into the casing and out the wellhead. PUMP, ROD – A class of downhole pumps in which the barrel, plunger, and standing valve are assembled and lowered into the well through the tubing. When lowered to its pumping position, the pump is locked to the tubing to permit relative motion between plunger and barrel. The locking device is a holddown and consists either of cups or a mechanical, metal-to-metal seal. PUMPING UNIT - A pump connected to a source of power; an oil-well pumping jack; a pipeline pump and engine. PUMPER - An employee of an operator who is responsible for gauging the oil and gas sold off the leases he has been assigned and who is also responsible for maintaining and reporting the daily production. REAL ESTATE INVESTMENT TRUSTS (REITs) – A trust or association that invests in a variety of real estate. REITs are managed by one or more trustees, like a mutual fund, and trade like a stock. No federal income tax needs to be paid by the trust if 75% of the income is real-estate related and 95% of the income is distributed to investors. Individual investors can be taxed. REEF RESERVOIR – A type of reservoir trap composed of rocks, usually limestone, made up of the skeletal remains of marine animals. Reef reservoirs are often characterized by high initial production that falls off rapidly, requiring pressure maintenance techniques to sustain production. RESERVOIR – A porous, permeable sedimentary rock formation containing quantities of oil and/or gas enclosed or surrounded by layers of less-permeable or impervious rock; a structural trap; a stratigraphic trap. REWORK OPERATIONS – Any major operation performed on a well after its completion in an attempt to restore or improve its ability to produce. ROTARY TONGS – The massive, counter-weighted tongs used on the drill floor to screw joints of drillpipe, tubing or casing; the generic term for the heavy wrenches used by the rough necks on the rig floor. ROYALTY, LANDOWNER’S – A share of gross production of oil and gas, free of all costs of production. Occasionally, the term is used to describe an interest in production created by the landowner outside the lease and distinguished from the conventional lessor’s royalty. In this case the landowner’s royalty, outside of the lease, may have any specified duration. In general usage, landowner’s and lessor’s royalty are synonymous. SALT WATER DISPOSAL WELL – Many wells produce salt water while producing oil. The disposal of this water is a problem to an operator because of pollution. The best solution to the problem is to pump the waste back into a formation that is deep enough not to pollute shallow water sands. Many stripper wells which are no longer commercial are converted for this purpose. SATURATION – (1) The extent to which the pore space in a formation contains hydrocarbons or connate water. (2) The extent to which gas is dissolved in the liquid hydrocarbons in a formation. SCOUT TICKETS – A written report of wells drilling in the area. The reports contain all pertinent information – all that can be found out by the enterprising oil scout; operator, location, lease, drilling contractor, depth of well, formations encountered, results of drillstem tests, logs, etc. On tight holes the scout is reduced to surreptitious means to get information. Talks to water hauler, to well-service people who may be talkative or landowner’s brother-in-law. The bird-dogging scout estimates the drillpipe set-backs for approximate depth; he notes the acid trucks or the shooting (perforating) crew; and through his binoculars, he judges the expressions on the operator’s face: happy or disgruntled. SECONDARY RECOVERY – A broad term encompassing any method of extracting oil from a reservoir after a well or field has exhausted its primary production. SEDIMENTARY ROCKS - Rock is generally classified in one of three categories: a. Sedimentary; b. Igneous; c. Metamorphic. SEPARATOR GAS – Natural gas separated out of the oil by a separator at the well. SET CASING – To cement casing in the hole. The cement is pumped downhole to the bottom of the well and is forced up a certain distance into the annular space between casing and the rock wall of the drill hole. It is then allowed to harden, thus sealing off upper formations that may contain water. The small amount of cement in the casing is drilled out in preparation for perforating to permit the oil to enter the casing. The decision to set casing (or pipe) is an indication that the operator believes he has a commercial well. SETTLED PRODUCTION – The second phase of production in the producing life of a well. (see IP). SHALE – A very fine-grained sedimentary rock formed by the consolidation and compression of clay, silt, or mud. It has a finely laminated or layered structure. Shale breaks easily into thin parallel layers; a thinly laminated siltstone, mudstone, or claystone. Shale is soft, but sufficiently hard packed (indurated), so as not to disintegrate upon becoming wet. However, some shales absorb water and swell considerable, causing problems in well drilling. Most shales are compacted, and consequently, do not contain commercial quantities of oil and gas. SHOT HOLE – A small-diameter hole, usually drilled with a portable, truck-mounted drill, for “planting” explosive charges in seismic operations. SHUT IN – To close the valves at the wellhead so that the well stops flowing or producing; also describes a well on which the valves have been closed. SOUR GAS – Natural gas containing chemical impurities, a notable hydrogen sulfide (H2S) or other sulfur compounds that make it extremely harmful to breathe even small amounts; a gas with disagreeable odor resembling that of rotten eggs. SQUEEZING A WELL – A technique to seal off with cement a section of the well bore where a leak or incursion of water or gas occurs; forcing to the bottom of the casing and up the annular space between the casing and the wall of the borehole to seal off a formation or plug a leak in the casing; a squeeze job. STRATIGRAPHIC TEST – A test well drilled to obtain information on the thickness, lithology, porosity, and permeability of the rock layers drilled through or to locate a key bed. Such wells are often drilled to evaluate a potentially productive pay zone. STRIPPER WELL – The final state in the life of a producing well. STRUCTURAL TRAP – A fold or break (or both) in the earth’s crust which creates an impervious trap for oil and gas. Oil will migrate underground through rock until it is “trapped”. SUCKER ROD - Steel rods that are screwed together to form a “string” that connects the pump inside a well’s tubing downhole to the pumping jack on the surface; pumping rods. SURFACE PIPE - Pipe which is set with cement through the shallow water sands to avoid polluting the water and keep the sand from caving in while drilling a well. SWAB - A tool which is lowered down the pipe on a wire line. The “swab” is then pulled out of the hole. As it travels up the pipe, rubber elements expand so that the fluid in the pipe is trapped above the swab and pushed to the surface. This operation is necessary when the formation pressure is not high enough to blow the fluids in the pipe to the surface. SWEET CRUDE - Crude oil containing very little sulfur and having a good odor. SWEET GAS - Natural gas free of significant amounts of hydrogen sulfide (H2S) when produced. 3-D SEISMIC PROGRAM – Seismic surveys shot from surfaces to map underground stratigraphy; to profile the underlying strata in search of up-dips, down dips, faults, and other promising anomalies. TANK BATTERY – A group of tanks at a well site used to store oil prior to sale to a pipeline company. TESTING – When each new well is competed, a series of tests are run on the well. The various tests are used to estimate the daily deliverability, payout, and reserves. TIGHT HOLE - A drilling well about which all information – depth, formations encountered, drilling rate, logs – is kept secret by the operator. TOTAL DEPTH (T.D.) – The depth of a well when drilling is completed. Total depth of a well is the vertical distance from the rig floor to the bottom of the hole. A 10,000-foot well may take 11,300 feet of casing to complete the well because the well bore has drifted several degrees from vertical, adding 1,300 feet to the depth of the hole, not the depth of the well. TRAP – A type of geological structure that retards the free migration of oil and concentrates the oil in a limited space. A mass of porous, permeable rock that is sealed on top and down both flanks by nonporous, impermeable rock, thus forming a trap. TUBING - Small diameter pipe which is installed in the casing. Oil is produced through tubing because it increases the viscosity of fluid and a well’s flow capabilities. TURNKEY CONTRACT - A contract in which an operator or drilling contractor agrees to furnish all labor and materials necessary to drill a well to a certain depth or stage of completion for a specified sum of money. The operator or contractor assumes all of the responsibility and risks involved in completing the operation. UNASSOCIATED GAS - Natural gas occurring alone, not in solution or as free gas with oil or condensate. VISCOSITY – The resistance of fluid to flow. A high viscosity fluid will not flow as easily as a low viscosity fluid (Mud will not move as easily as water). WATER CONNING – The encroachment of water in a well bore in a water-drive reservoir owing to an excessive rate of production. The water below the oil moves upward to the well bore through channels, fissures, and permeable streaks, leaving the oil sidetracked and bypassed. WATER FLOODING – A secondary recovery method for the production of oil from a formation. Oil will float on water. When water is injected into some formations, the oil will float or be washed to the surface, thereby, increasing the amount of production from a well or field. Some formations will not react to this type of stimulation. WELL COMPLETION – The work of preparing a newly drilled well for production. This is a costly procedure and includes setting and cementing the casing, perforating the casing, running production tubing, hanging the control valves (nippling up the production tree, i.e., Christmas tree), connecting the flow lines, and erecting the flow tanks or lease tanks. WELL COST, AVERAGE - In 1983, the average cost to drill, case, and complete a well was $410,000. Included in this average were many deep, multimillion dollar wells – the 15,000 to 25,000-foot gas wells – any many thousands of shallower wells costing $250,000 or even less. WELL LOGGING - Gathering and recording information about the surface formation, the nature and extent of the various downhole rock layers. Also included are records kept by the driller, the record of cuttings, core analysis drillstem tests, and electric, acoustic, and radioactivity logs. Any pertinent information about a well, written and saved, is a log – from sailing ship days. WHIPSTOCK – A tool used at the bottom of the borehole to change the direction of the drilling bit. The whipstock is, essentially, a wedge that crowds the bit to the side of the hole, causing it to drill at an angle to the vertical. WHITE OIL - A colloquial term for condensate, gas condensate, casinghead gasoline; liquid hydrocarbons produced with natural gas. WILDCAT - A well that is drained one or more miles from a proven well. WORKING INTEREST - A working interest in an oil or gas property is one that is burdened with the cost of development and operation of the property, such as the responsibility to share expenses of drilling completing or operating an oil and gas property, according to working or operating mineral interest in any tract or parcel of land. Rights to overriding royalties, production payments, and the like do not constitute working interests because they are not burdened with the responsibility to share expenses of drilling, completing, or operating oil and gas property. Likewise, contract rights to extract or share in oil and gas, or in the profits from extraction, without liability to share in the costs of production do not constitute working interests. WORKING INTEREST, FULL-TERM - A working interest that lasts as long as the well or the lease is productive; as long as oil and gas are produced in quantities that make the well economic to operate. WORKOVER – Operations on a producing well to restore or increase production. Tubing is pulled and the casing at the bottom of the well is pumped or washed free of sand that may have accumulated. WRITE-OFFS - That portion of an oil investment which is deductible for tax purposes. All intangibles are deductible. The information on this website should not be deemed a solicitation of any person to purchase a security or as an offer by Fox Investment Company or any affiliated 'Jason Fox' company to sell any security to any person. The information contained in this website is for informational purposes only. Why invest in oil & gas drilling ventures? Billions of Dollars Invested by Institutional and Professional Oil industry investors. Every year very sophisticated individual and institutional investors from outside the oil business put billions of dollars into drilling for oil and gas in the United States. These oil and gas investors include extremely wealthy individuals, foreign investors, trust departments of major banks, large life insurance companies, major industrial companies, and pension funds who invest in oil and gas drilling strictly for profit as they have no need for the tax benefits. Why do they invest in oil and gas when they can choose from the whole spectrum of investments and they know firsthand the risks of exploring for oil and gas? They invest in oil and gas to get invulnerable long-term economic value, cash flow, dramatic upside potential and permanent tax benefits. Long-Term Economic Value. Even though oil and gas wells deplete over the years, oil and gas properties often become more valuable with age, even after a large portion of their primary reserves has been produced. There are three reasons for this. (1) Shallower and deeper bypassed productive zones are often re-developed. (2) New well completion, treatment and production techniques and secondary recovery can lead to greatly increased field production. (3) Oil and gas prices have increased over time. Dramatic Upside Potential. The primary reason that many of the world’s largest and most sophisticated investors continue to invest billions of dollars every year to drill oil and gas wells is the dramatic upside potential of a big discovery; finding oil and gas field. It is the huge potential of new field discovery wells that sets oil and gas investments apart from all others. Oil and gas companies regularly complete new field discovery wells where there is an extremely high ultimate return. For example, a gas field with 100 billion cubic feet of reserves has $300 million of un-discounted reserves at $3 per thousand cubic feet (Mcf). A single well in a field may have reserves of 3 to 15 billion cubic feet of gas. Which at a natural gas price of $3.00 per Mcf, it has a gross value of $9,000,000 to $45,000,000 (nine to forty-five million dollars) for one well? Then all subsequent wells drilled in that field, to that newly discovered pay zone, are now not high risk exploration wells but low risk developmental wells. Furthermore, it is at this point that the real profits are now realized, by drilling low risk offset development wells, in a now known reservoir. Increasingly Widespread Liquidity. Major Oil and Gas Property Auctions first appeared in the late 1980’s and have grown into a ready marketplace in which to buy and sell oil and gas properties. Prior to the exchange auctions selling an oil and gas interest was extremely difficult and time consuming. Several major auction companies, such as the Oil & Gas Journal Exchange, Oil & Gas Asset Clearinghouse and Producing Property Exchange, conduct exchange auctions through out each year. Auctions are held almost monthly, at locations in Houston, Dallas, Midland, Tulsa and Oklahoma City. Exchange auctions can be attended in person or on-line via the Internet. Major oil companies, Independents and individuals utilize these auction markets to sell and buy properties, ranging from multi-well packages to fractional interests in a single well, including royalty, overriding royalty and working interests. At typical auctions’ tens of millions of dollars will change hands. In addition to a stable auction marketplace to sell oil and gas interests, the worldwide Oil and Gas Futures Market affirm daily, a dollar value for oil and gas production and reserves. Oil and Natural Gas…Physical and Political Safety. One attraction of oil and gas for foreign investors is the physical invulnerability of oil and natural gas reserves. Oil and natural gas are imbedded in reservoirs of rock thousands of feet under the ground. Safely buried there for millions of years, it cannot deteriorate, it cannot easily be stolen, and it cannot be destroyed even by bombs. Part of World War II was fought on the Wittenberg gas field in Germany. After the war, a major oil company re-drilled the field and is still producing natural gas as it has since the 1920’s. Onshore oil and gas properties and reserves in the United States are both physically and politically safe in a troubled world and furthermore they are the world’s finest asset in the world’s safest place. Many experienced oil and gas investors permanently avoid federal income tax altogether by “reinvesting” their oil and gas income; that is, by continually reinvesting it in new oil and natural gas projects. In this way, they get a compounded growth of their oil and gas income in the ground tax-free forever. Few independent oil companies ever pay much income tax. As with all investments, each investor is urged to consult their own advisors as to the benefits an investment in oil and natural gas may have regarding the federal income tax consequences and how it may apply to their individual tax situation. The Power of Oil. Oil and natural gas have proven time and time again to provide safe long-term economic value, as easily valued commodities that are the most essential basic commodities of the worlds’ growing industrial societies providing fuel, power and feedstock. So great is the economic power of oil that it has propelled relatively obscure countries and even entire regions to commercial and financial preeminence. Oil and gas are the largest business in the world. Of the top companies in the Fortune 500, oil companies rank in the top. Exxon’s net income alone was greater than the sales of more than half of the Fortune 500. Of the richest 490 people in the world featured in Forbes 2001 Billionaires Issue, 33 billionaires, worth a combines $69.6 billion, had their origins in oil or natural gas. Fueled by rising worldwide energy prices, black-gold billionaires are seeing a surge in profits. Today, the person who owns a relatively small natural gas well or two with recoverable reserves 500,000 Mcf of natural gas is a multi-millionaire. A little oil and natural gas can be worth a lot of money. Why Invest in Oil and Natural Gas? Simply stated, there currently exists an evolving global energy supply and demand shift. Worldwide demand is increasing and will continue to do so in the future. This increasing demand is being driven by two basic factors. First, the transformation from communism to capitalism, in Eastern Europe and Southeast Asia, combines with their inexpensive labor force and their currently developing emerging markets are attracting investment capital to these former communist countries. Their citizens, which now has access to the rest of the world, strongly desire to own and enjoy many of the mechanical convinces, such as cellular telephones, sophisticated entertainment systems, household appliances and automobiles the western world has enjoyed for years. These new worldwide markets now require an ever increasing energy supply to produce, manufacture, transport and operate these goods. Second, the ever increasing world population growth. Simply stated more people require more goods and services, and therefore more and more energy is required to manufacture, transport and operate these new and additional goods and services. Demand for Electric Power is Escalating. The demand for power is escalating with the increased use of computers and electronic devices, as well as for winter heating and summer cooling. To meet this demand, electric utilities are building new gas-fired combined turbine generator power plants, boosting the year-round demand for natural gas. As a result, owners and producers of natural gas will benefit in the US, which is the world’s largest market. Domestic Natural Gas Prices Remain High. The domestic natural gas market remains strong. More and more electric utilities are looking to natural gas as an energy source, in which to fuel the new gas-fired combined turbine generator power plants being installed through out the US. Have you invested in any of the following? Oil and Natural gas from domestic reserves helps to make our country more energy self-sufficient by reducing our dependence on foreign imports. In light of this, Congress has provided tax incentives to stimulate domestic natural gas and oil production financed by private sources. Drilling projects offer many tax advantages and these benefits greatly enhance the economics. These incentives are not “Loop Holes” — they were placed in the Tax Code by Congress to make participation in oil and gas ventures one of the best tax advantaged investments. Congressional Incentives Encourage Domestic Petroleum Development Oil and Natural gas from domestic reserves helps to make our country more energy self-sufficient by reducing our dependence on foreign imports. In light of this, Congress has provided tax incentives to stimulate domestic natural gas and oil production financed by private sources. Drilling projects offer many tax advantages and these benefits greatly enhance the economics. These incentives are not “Loop Holes” — they were placed in the Tax Code by Congress to make participation in oil and gas ventures one of the best tax advantaged investments. Congressional Incentives Encourage Domestic Petroleum Development Oil and Natural gas from domestic reserves helps to make our country more energy self-sufficiently reducing our dependence on foreign imports. In light of this, Congress has provided tax incentives to stimulate domestic natural gas and oil production financed by private sources. Drilling projects offer many tax advantages and these benefits greatly enhance the economics. These incentives are not “Loop Holes” — they were placed in the Tax Code by Congress to make participation in oil and gas ventures one of the best tax advantaged investments. Income (not Net Income) from an oil and gas producing property to be tax-free. Alternative Minimum Tax Prior to the 1992 Tax Act, working interest participants in oil and gas ventures were subject to the normal Alternative Minimum Tax to the extent that this tax exceeded their regular tax. This Tax Act specifically exempted Intangible Drilling Cost as a Tax Preference Item. “Alternative Minimum Taxable Income” generally consists of adjusted gross income, minus allowable Alternative Minimum Tax itemized deduction, plus the sum of tax preference items and adjustments. “Tax preference items” are preferences existing in the Code to greatly reduce or eliminate regular income taxation. Included within this group are deductions for excess Intangible Drilling and Development Costs and the deduction for depletion allowable for a taxable year over the adjusted basis in the Drilling Acreage and the wells thereon. Tax Bill Gives Incentive to Marginal Wells The US Senate and House of Representative have passed a tax incentive bill to help small oil and gas producers. This bill provides a tax credit of up to $9 per well per day for marginal wells. A typical marginal well pumps 15 barrels of crude or 90 thousand cubic feet of gas per day. There are 650,000 “marginal” or “stripper” oil and gas wells in the USA. Marginal wells provide as much as 25 percent of the nations’ crude supply (on par with Saudi Arabia) and about 10 percent of gas stocks. In 2002 alone, 17000 oil and gas wells were permanently plugged with cement (13,600 oil wells and 3,900 gas wells). This tax bill will act as a safety net to save many of these wells, thereby reducing our reliance on the Middle East. The tax credit phases-in if the average crude price for a year is less than $18 a barrel or $2 per thousand cubic feet of gas. The maximum tax credit is $3 a barrel for the first three barrels of crude produced if prices plunge below $15 a barrel and 50 cents per thousand cubic feet if gas prices average less than $1.67 per thousand cubic feet. Crude oil is now above $54 a barrel on the New York Mercantile Exchange and gas futures are near $7 per thousand cubic feet.